Only 8 days to go until my vegetarian month is up, but I can’t believe it’s taken me this long to eat paneer. Paneer is one of my favourite ingredients, as it’s supremely versatile, and it’s a vegetarian’s delight. Luckily, my new flat is very close to a giant Sainsbury’s, and I recently discovered that they sell Savera paneer, which is the good kind – crumbly, not rubbery. For those of you who don’t know what paneer is, it’s a fresh, acid-set cheese (I’ve made it myself before, but decided it wasn’t worth the time when it’s so easy to buy). It takes on the flavour of whatever it’s cooked in (a bit like chicken), and it doesn’t melt, so it can easily be used as a meat substitute. 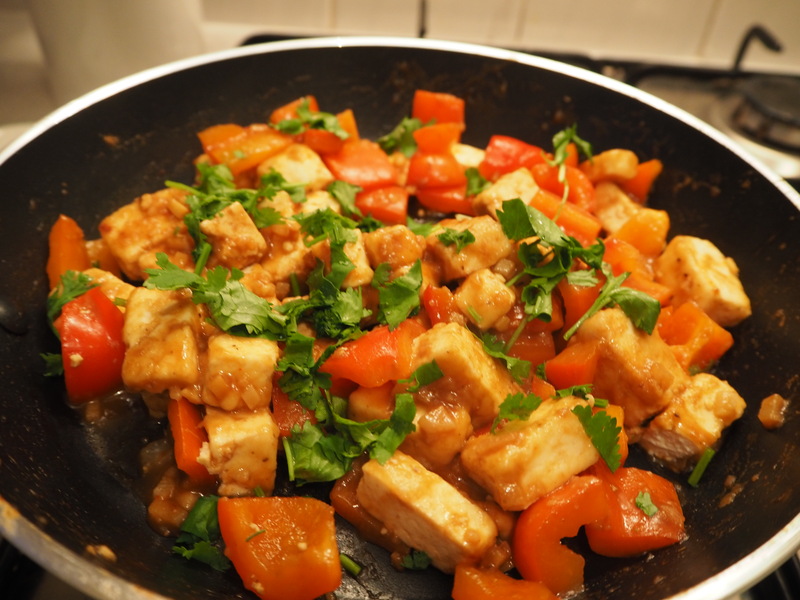 For last night’s meal, I decided to make chili paneer – an Indian-Chinese specialty. The phenomenon of this cuisine is a quite fascinating. It’s not Chinese, nor is it Indian, but rather a perfect fusion. In India, it’s even called Indian-Chinese, thus widely acknowledging that it’s not actual Chinese food. 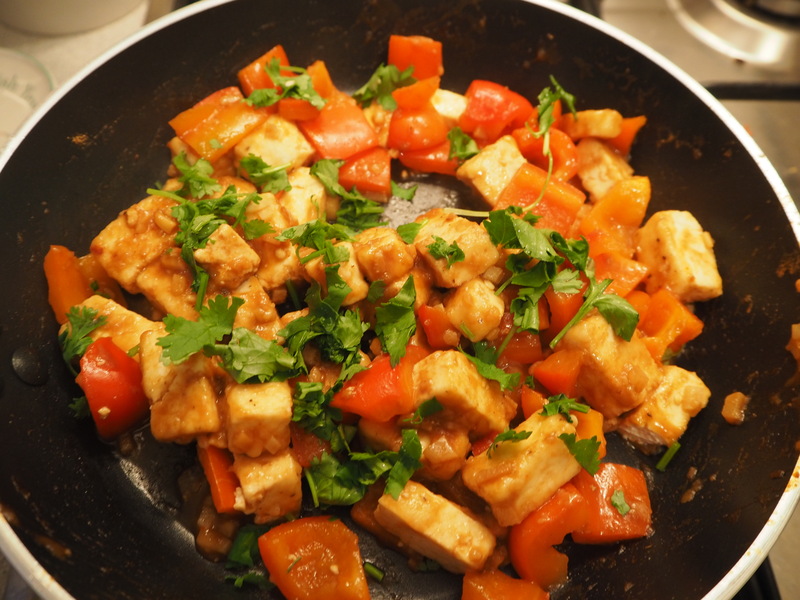 Chili paneer uses both Chinese and Indian ingredients, and it’s a favourite of mine. One of my university friends used to make it for me all the time, and eating it tonight made me remember him very fondly. I used this recipe for inspiration, but as I didn’t have any spring onions, I used fresh coriander instead, plus a couple of other tweaks. I ate it with Basmati rice, but you could also switch it up for sticky rice (there’s no end to this fusion!). It’s a very simple recipe that can easily constitute a quick weeknight dinner. 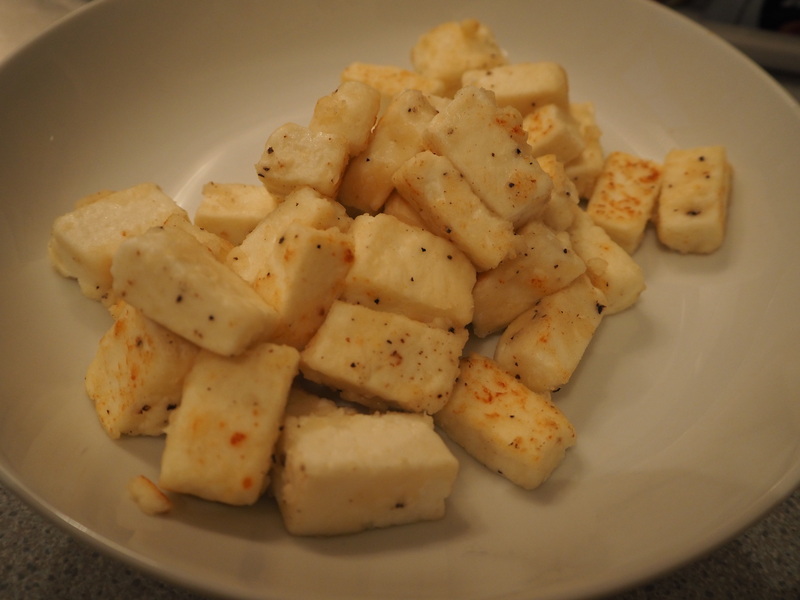 Combine the flour, salt, and pepper in a bowl, and roll the paneer pieces in it until coated. Heat the vegetable oil in a non-stick pan and fry the paneer pieces for a few minutes. They will turn a little golden, but not too much due to the flour, so don’t fry them for more than a few minutes, else they’ll turn hard. Remove them from the pan and keep aside in a bowl. You could also deep-fry them, if you like – I prefer it a little healthier! Heat the sesame oil and fry the ginger and garlic for a couple of minutes until fragrant. 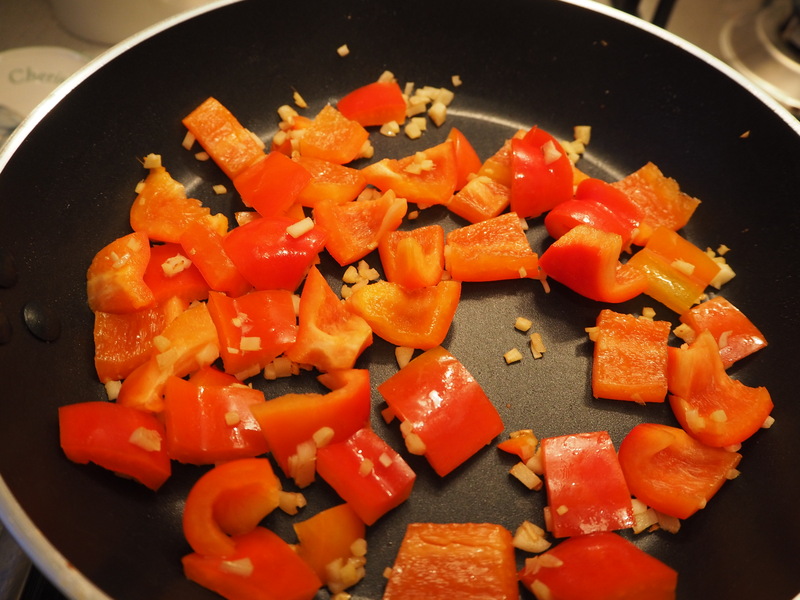 Add the red pepper, fry for a minute or so, and then add a dash of water to help soften. Let the water boil off a little before adding the paneer pieces back in. Stir and mix in the soy sauce, sriracha, lemon juice and cumin powder. Add some salt to taste, and garnish with fresh coriander. And you’re done!